Importance of nuclear energy was recognised as soon as India became independent. The Atomic Energy Act, 1948 was published with sole intent to develop nuclear research for peaceful purposes.The first stage of India's three stage nuclear power programme is energy generation using Pressurised Heavy Water Reactors, fuelled by Natural uranium and produces Plutonium-239 as by-product. Out of the 20 operational nuclear reactors of India, eighteen are Pressurised Heavy Water Reactors. How Pressurised Heavy Water Reactors work? Nuclear Reaction: Nuclear reactors generate energy through fission, the process by which an atomic nucleus splits into two or more smaller nuclei, along with the release of neutrons. During fission, a small amount of mass is converted into energy, which can be used to power a generator to create electricity. In order to harness this energy, a controlled chain reaction. All fissionable and fissile (material that is capable of sustaining a chain reaction - U235 and Pu239) isotopes undergo a small amount of spontaneous fission which releases a few free neutrons into any sample of nuclear fuel. Such neutrons would escape rapidly from the fuel and become a free neutron, with a mean lifetime of about 15 minutes before decaying to protons and beta particles. However, neutrons can also be absorbed by other nuclei in the vicinity long before this happens. Some neutrons will impact fuel nuclei and induce further fissions, releasing yet more neutrons. If enough nuclear fuel is assembled in one place, or if the escaping neutrons are sufficiently contained, then these freshly emitted neutrons outnumber the neutrons that escape from the assembly, and a sustained nuclear chain reaction will take place. Pressurised Heavy Water Reactors : Neutrons produced by fission have high energies and move extremely quickly (newly-created fission neutrons move at about 7% of the speed of light, and even moderated neutrons move at about 8 times the speed of sound). These so-called fast neutrons do not cause fission as efficiently as slower-moving ones. So they are slowed down in most reactors by the process of moderation. Heavy water, an excellent moderator cools the neutrons by absorbing its kinetic energy to optimum energies for causing fission. These slower neutrons are also called thermal neutrons because they are brought to the same temperature as the surrounding coolant. In PWHRs Heavy water is used as both moderator and Coolant. Moderator : A medium that reduces the speed of fast neutrons, thereby turning them into thermal neutrons capable of sustaining a nuclear chain reaction.Commonly used moderators include regular (light) water (roughly 75% of the world's reactors), solid graphite (20% of reactors) and heavy water (5% of reactors). Coolant : A coolant is a fluid which flows through a device to prevent its overheating, transferring the heat produced by the device to other devices that use or dissipate it. 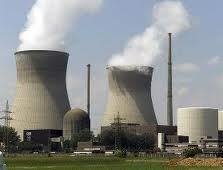 All the nuclear reactor units of Rajasthan, Kaiga, Kakrapar, Madras and Narora are based on PHWRs. Two of the four units of Tarapur are also based on PHWRs. Also India is ready to sell Pressurised Heavy Water Reactors of 220 MWe or 540 MWe capacity to other countries. These reactors, which use natural uranium as fuel and heavy water as both moderator and coolant, offered a basket of options for countries looking for cost-competitive and proven technologies in the small- and medium-sized reactors. 18 July, 2011 : India begins construction of 25th nuclear plant.The first pour of concrete for the 700 MW indigenous Pressurised Heavy Water Reactor (PHWR), the seventh nuclear plant at the Rajasthan Atomic Power Station (RAPS) took place at Rawatbhata.